Buster Keaton was one of the biggest filmmakers and actors during the Silent Era. Together with Charlie Chaplin, he was one of the best in making movies that combined funny moments with fascinating creativity. Many of his works are short films and here are a list presented with the best of them. As so many times before the character of Keaton are rejected by a girl, but a sequence of events makes him to the unexpected hero. After being locked in prison by a transformation from citizen to convict he makes another transformation to guard and stops a riot. Keaton is both life guard and alleged killer at the same time, concerning the same person. It is the last scenes - in the house showing all ways a man can run, hide and incapacitate others in a way no one thought of before - that makes this one of the best Keaton movies. Keaton goes out to the sea with his family. All sorts of trouble await them until the rather abrupt end in which that all get on land after a shipwreck without knowing there. The protagonist - of course played by Keaton himself - is poor and find himself with the prospect. He is going to attempt suicide, but it seems not working. One of the ingenious scenes showing Keaton running out in front of two lights heading forward in the dark, but it turns out that is no automobile, but two motorcycles driving parallel to each other and instead out a collision they flanks the suicidal. Fatty Arbuckle as a cook and Buster Keaton as seductive waiter. Definitely one of the most entertaining short films with Arbuckle and Keaton together. The scene when Buster sinks the big ship to being able to row away with the lifeboat is unforgettable in a movie that also has some less exciting parts. Buster Keaton plays a man that in an attempt to become a business man he ends up being chased by a whole police department. Cops have many clever comedy scenes which Keaton was a specialist of. This short-film is unfortunately not preserved in it whole, but some of the scenes are terrific and in the trademark of Keatons artistry, creativity and ability to create funny moments. Buster Keaton and his partner in writing and directing Edward F. Cline shows their marvelous talents for imaginative situations in the film medium. The Haunted House shows also an original variation on the often used motifs with the unexpected hero in the end and also some advanced visuals for the movie at this time. 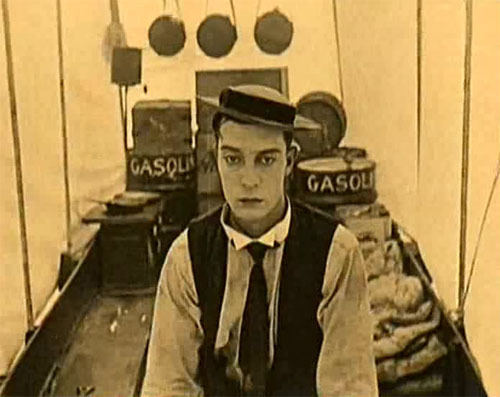 Buster Keaton, in one of his masterpieces, utilizing many of the possibilities of film making in less than 20 minutes. Classic scenes like that when a wall is falling over Keaton’s character and he is saved by the open window, and the bathtub scene which playing with the medium by putting a hand in front of the camera to cover a woman reaching for a towel.